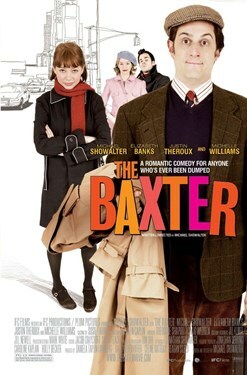 The Baxter is the kind of guy you "settle" for because you can't be with the one you really love. And no one's ever been more of Baxter than tax accountant Elliot Sherman. Nice but safe, Elliot has been left at the proverbial 'altar' more times than once. From high school to college to business school, Elliot always finds himself on the losing end of the love triangle. After a swearing-off of relationships once and for all, Elliot decides to take the plunge one last time when he meets his dream woman, beautiful magazine editor Caroline Swann. But just as he's about to hear wedding bells, her hunky, long-lost high school sweetheart Bradley Lake turns up, out of the blue, triggering Elliot's fears of yet another colossal dumping. As Elliot feels his life spinning into a downward spiral, things begin to change when he encounters Cecil Mills, an adorable office temp and aspiring singer, just off the bus from Fergus Falls, Minnesota. Cecil tells Elliot, "Your problem is that you're not willing to take a risk. Leading men take risks." As Elliot struggles to assert himself for the first time, a series of escalating comic events are set in motion, until finally, with Cecil's help, he learns how to step into center stage in his own life and leave Baxter-hood behind forever.